Bensenville Park District Holiday Happenings! 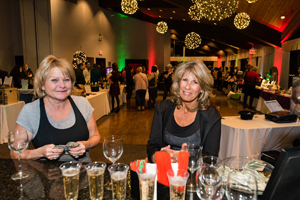 The Holiday Bazaar & Ladies Night Out features mini spa services, boutique shopping, DJ, drawings, demonstrations, and a welcome glass of champagne for those over 21. A $10 entrance fee includes complimentary drawing ticket! Bring a non-perishable food item and/or a toy to receive an additional drawing ticket. Pay at the door or purchase your tickets in advance at White Pines, Monday-Friday, 9am-5pm, and Saturdays from 9am-3pm. You may also purchase tickets at the Deer Grove Leisure Center, 1000 W. Wood Street during regular registration hours. For more information, please visit www.whitepinesgolf.com/special_events or call 630-766-0304, ext. 2. Step back to yesteryear and start the holiday season with this great family event. Enjoy an old-fashioned Christmas at Fischer Farm. 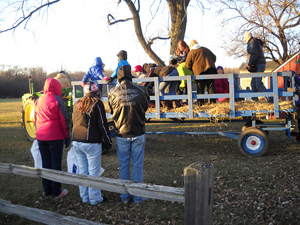 Attendees will take a hayride around the farm, then come in and warm up with hot chocolate and desserts inside the 1920s farmhouse while enjoying the sounds of the holiday season with instrumental music performed by the York High School Brass Quintet. For more information, please visit www.bensenvilleparkdistrict.org/pdcms/events or call 630-766-7015. 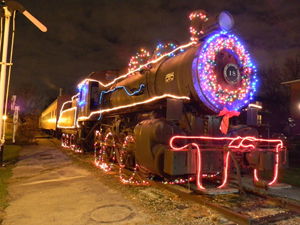 Bring the whole family for this special, unique holiday event and climb aboard the 1922 Black Chicago Gravel Steam Locomotive to head for the North Pole! Settle in as we watch The Polar Express movie on this historic train at Veterans Park located at Church Road and Main Street in Bensenville. “Passengers” will also enjoy hot chocolate, cookies, and popcorn. Bring your blanket and pillows. The fee is $7 per person. Space is limited to 50 passengers; sign up by Friday, December 11, at the Deer Grove Leisure Center located at 1000 W. Wood Street, Bensenville, IL. For more information, please visit www.bensenvilleparkdistrict.org/pdcms/events or call 630-766-7015. Fees: $14.99 for adults, $7.99 for children ages 5-11, and $4.99 for children 4 and under. Prices do not include tax and service fee. 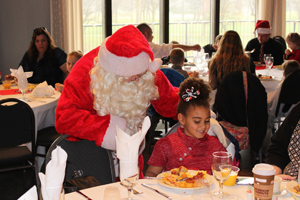 White Pines Golf Club & Banquets is hosting a holiday brunch featuring an appearance by good ol’ St. Nick. Children are able to visit and have a photo taken with Santa, join in holiday craft activities, and play games. The main buffet selections include scrambled eggs, bacon, sausage, baked French toast, breakfast casserole, biscuits and gravy, fruit display and salad bar. The special kid-size buffet will have favorites such as pizza, pigs in a blanket, pancakes, macaroni and cheese, tator tots, and fruit salad. Assorted breads, desserts and beverages are also presented. The fees for this event are $14.99 for adults, $7.99 for children ages 5-11, and $4.99 for children 4 and under. Prices do not include tax and service fee. White Pine’s is a facility of the Bensenville Park District and is located at 500 W. Jefferson, Bensenville. For more information about special events at White Pines, visit their website at www.whitepinesgolf.com/special_events. Space is limited; reservations are required at 630-766-0304, ext.2. For more information, please visit their website or call 630-766-7015 .